*For new clients we are offering Free Health Exams for up to 2 pets per family. Just mention this ad on are website when making your appointment. *Bring in 1 jar of peanut butter and jelly per pet on Monday, Wednesday, or Thursday to receive a FREE nail trim! It can happen to you. Fleas and ticks can silently invite themselves onto your pet and into your home. These pests can then harm your pet and make your home, well… less comfy. Capstar is an orally administered tablet that provides fast flea relief. In fact, Capstar starts working within 30 minutes. A single dose of Capstar should kill the adult fleas on your pet. If your pet gets reinfested, it is safe to give another dose as often as once per day. This product can be used on dogs and cats. ***We must have a current Heartworm Test on your pet for your heartworm prevention to be refilled. Purchase a 12 month supply of Heartgard and get a $12.00 mail in rebate. HEARTGARD Plus is highly effective in preventing heartworm disease. Heartworm disease is a serious threat to the health of your dog. To protect your dog from heartworm disease give HEARTGARD (ivermectin) once-a-month year-round or as directed by your veterinarian. HEARTGARD Plus also provides treatment and control of 2 roundworms and 3 hookworms in a Real-Beef Chewable that dogs love. Trifexis is a once-monthly tablet that kills fleas, prevents heartworm disease and treats and controls adult hookworm, roundworm and whipworm infections. And since it's beef-flavored, you can offer it as a treat. Revolution is the safe, simple way to protect your cat from heartworms, fleas and other harmful parasites. Protecting pets from harm is one of the important promises that bonds people and their pets. Revolution is a topical application of heartworm prevention and flea prevention. 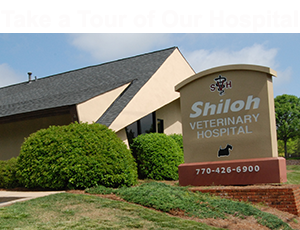 *Currently at Shiloh Veterinary Hospital we only carry Feline Revolution. The ONLY 6-month heartworm disease protection. Proheart is an injection based medicine that protects your dog against heartworms.